Science is not a subject I excel in. 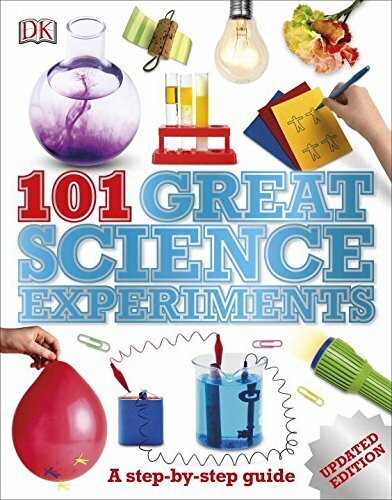 I enjoy reading about and talking about science, but when it comes to science experiments, I enlist the assistance of my husband. If he can make something blow up, dissect something, or take part in something that is gross to the average person, he’s all in. When he’s all in, the kids are all in. It’s not that I’m not interested in Science. I totally am. I love learning new facts and interesting things just like the next person, it’s just that I never really had the opportunity to really dig my hands into everything that Science entailed when I was growing up. 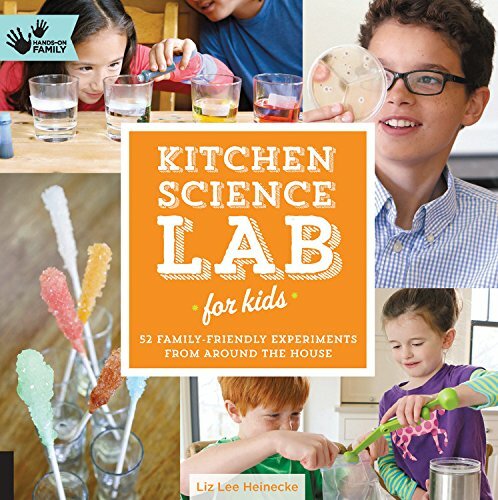 Lately, I’ve been sharing some science projects you can do in your own home easily! So these discussions are just as much for me as they are for you, my dear readers! I hope the ideas shared, book lists, and unit studies help to give you ideas of things you can do in your own homeschool! And just remember, Science is so fun, inventive and imaginative that it’s literally possible to learn and explore something new each and every day! 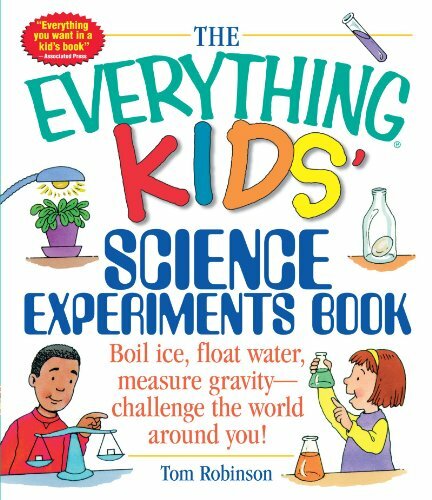 Have fun opening up the world of Science to your children. 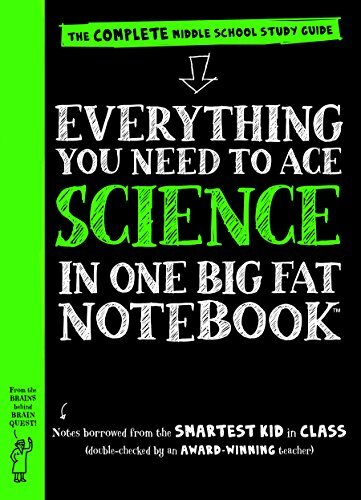 Here are some of our favorite Science books! 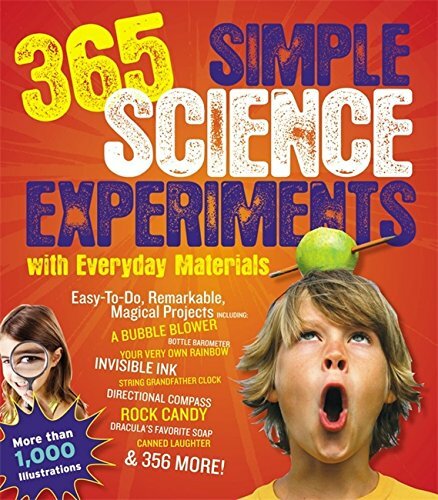 The Everything Kids’ Science Experiments 101 Great Science Experiments Everything You Need to Ace Science The Book of Totally Irresponsible Science: 64 Daring Experiments for Young Scientists Kitchen Science Lab for Kids: 52 Family Friendly Experiments from Around the House (Lab Series) 365 Simple Science Experiments With Everyday Materials. So much fun. Read: Ways to Make Learning the Periodic Table Fun! PLUS- Free unit Study! 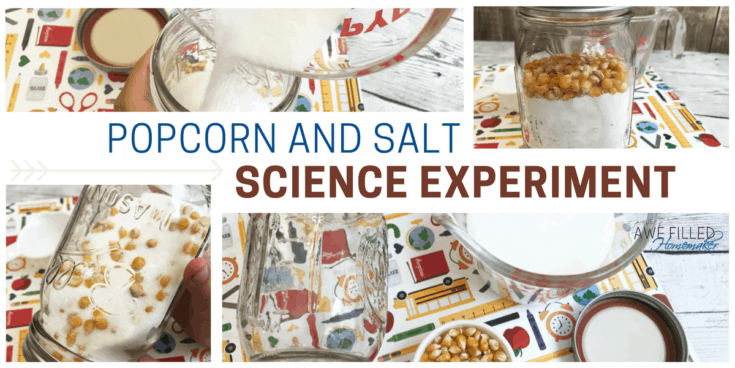 Let’s dig deep into Science experiments with this super fun popcorn and salt Science Experiment! Popcorn is one of America’s favorite snack foods. It has been around for a long time! (It’s really popular on movie nights in our house, for sure!) American history alone dates popcorn back to the days of pilgrims when they discovered if they left corn on the fire, fluffy white yummy goodness was made! Technically, I could make it here in my Instant Pot or on my stove top, but I must confess – movie theater popcorn is my weakness! I can’t explain what makes it so wonderful…oh wait, yes I can. The magical movie theater butter! 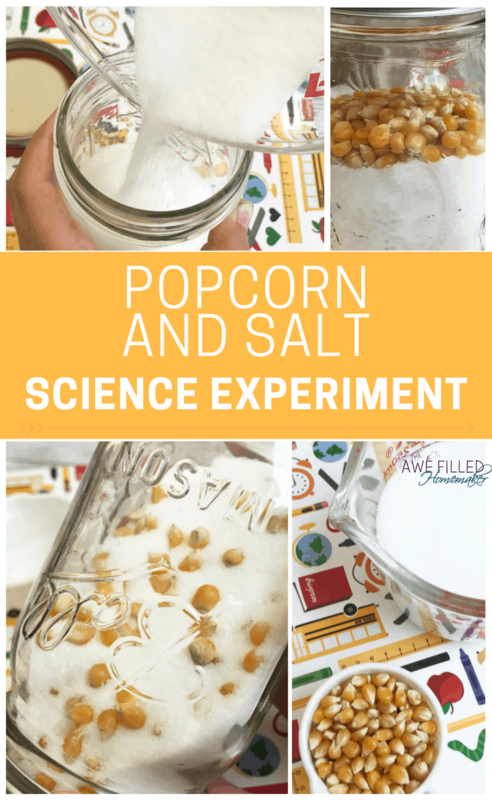 Using popcorn for a home science project a cheap and fun way to teach kids! I hope you enjoy this project and make memories that will last! By the way, if you take pictures I would love to see them! 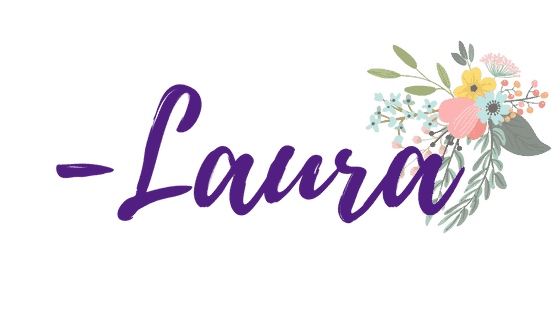 Join our group above and feel free to share! 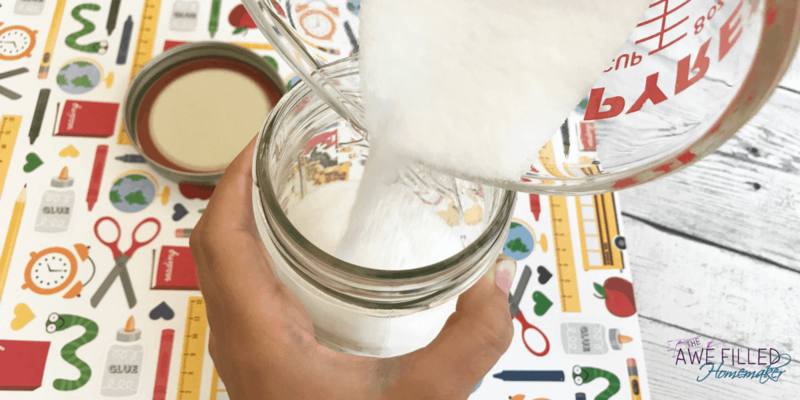 This experiment is so simple, you only need three ingredients! 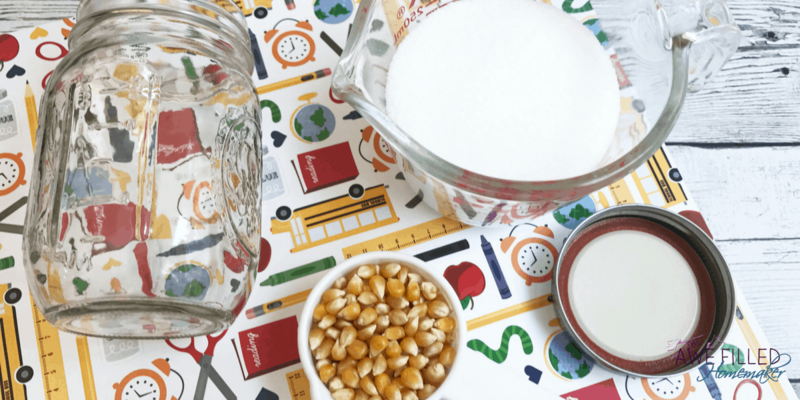 1) Pour the salt & popcorn kernels into the jar and seal with the lid. 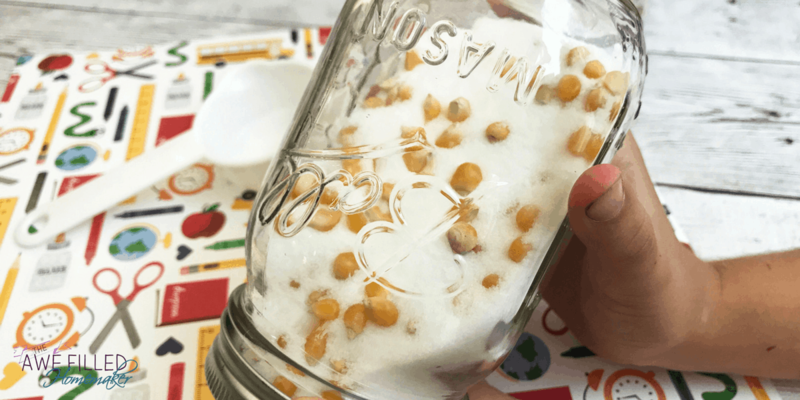 2) Roll the jar on a flat surface so the salt and popcorn mix together. 3) Turn the jar upright and gently tap in on a flat surface. Watch what happens to the popcorn. Here’s the short version of the video for this craft. For the long, click HERE and watch on my youtube. By the way, I’d love to have you subscribe to my youtube while you’re there. Now is the time to write out your hypothesis! In order to get your kiddos thinking about their own scientific thought process, it’s always a good idea to ask them some questions about the latest experiment. Q: Does the popcorn and salt stay mixed? A: The popcorn and salt actually become sorted. 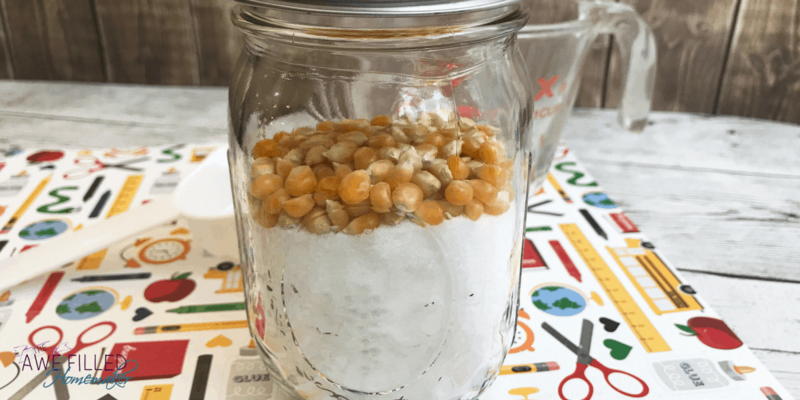 Tapping the jar against a flat surface loosens the salt so it falls below the popcorn to form a solid layer whereas the popcorn rises to the top of the salt. Don’t limit the follow-up Q and A session to just one question! Have fun asking their thought process from beginning to end. Some other questions to consider asking for this experiment? Did the experiment end up how they thought it would? How close was their initial hypothesis to the actual results? What would they change about the experiment if they could to get a different outcome? 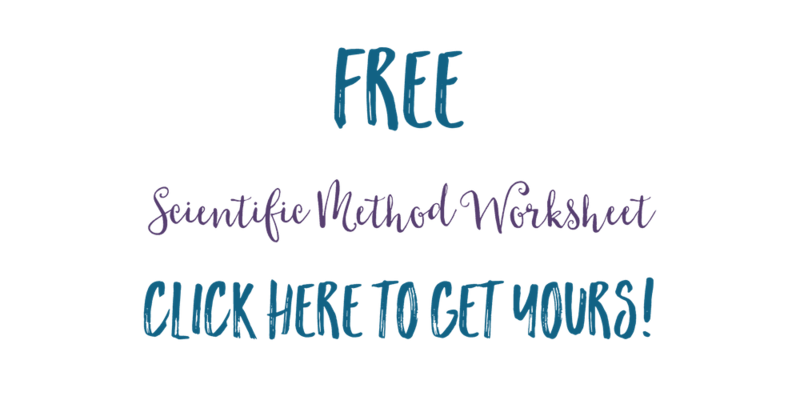 Use the love and excitement of Science as a great way to open up the doors to communicate about the results! It’ll bring a whole other component to the end results that you’ll love as well! I sure hope you enjoyed this project! Don’t forget to print off the instructions to have handy! 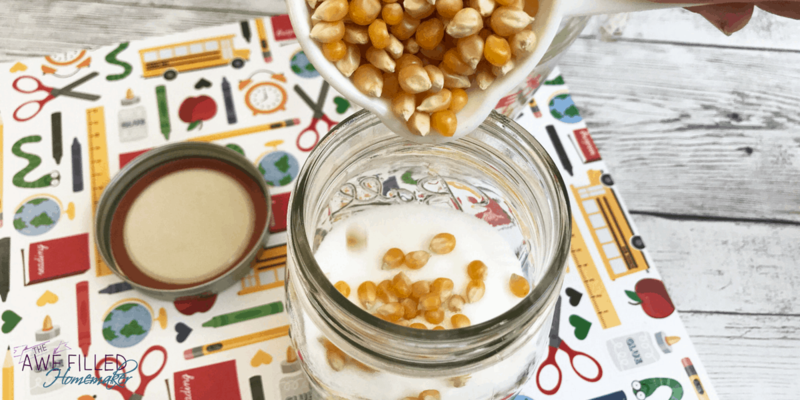 Pour the salt & popcorn kernels into the jar and seal with the lid. 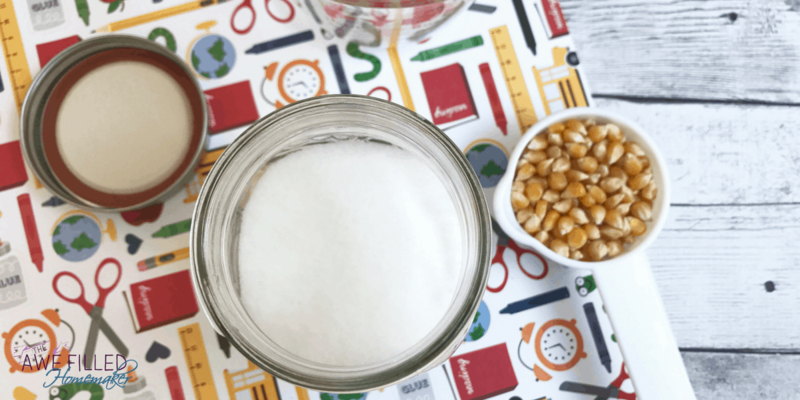 Roll the jar on a flat surface so the salt and popcorn mix together. 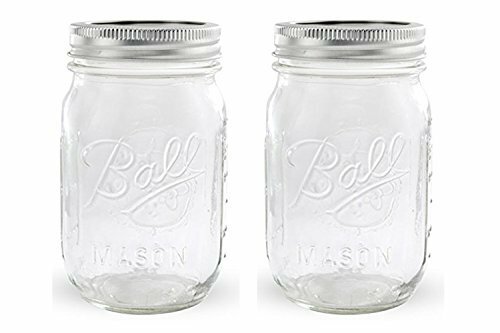 Turn the jar upright and gently tap in on a flat surface. Watch what happens to the popcorn. Now it is time to think about what was learned. Remember in Science that a hypothesis is a well thought out prediction. Previous Post: « Air Fryer Pigs In a Blanket! I’m thinking of doing this for our school science night! But my questions is WHY does the salt fall to the bottom and the popcorn rise? I would think the popcorn is heavier…..
It’s not about weight, but size. Because the salt particles are smaller, they can slip through the gaps between the popcorn and sink to the bottom, laveing the popcorn at the top. 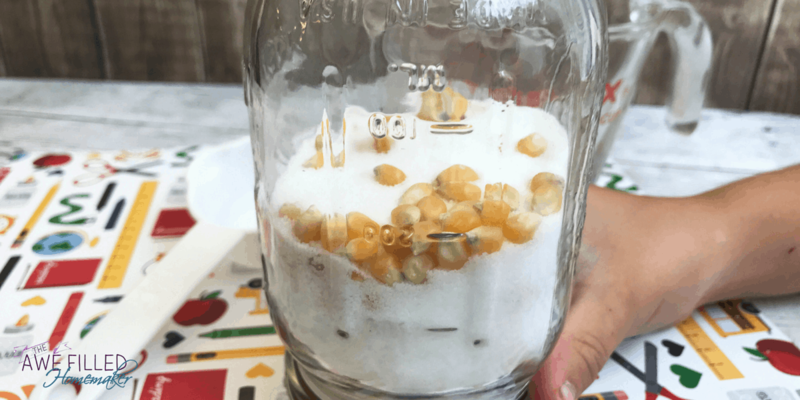 the corn has a lower density than the salt, it floats to the top. the shaking is just to overcome friction like oil on water. Can’t be that – think about pebbles and water molecules. Has to be density. Salt is more dense than popcorn. Popcorn has more air space within it, allowing it to come to the surface. A better way to show this density lesson is using various liquids: water vs soap, oil, syrup. Even a few drops of food coloring is more dense than just water which causes the food coloring to sink to the bottom of a glass of water. The popcorn & salt are both solids so it is actually the size. The salt slides right through the creases between the popcorn kernels gradually elevating the popcorn to the top as the salt slides underneath. Because the kernels are rounded they leave too much open space between one another. This allows the grains of salt which are smaller to fall through the cracks to the bottom. Any ideas for making this into a Bible Story for church? 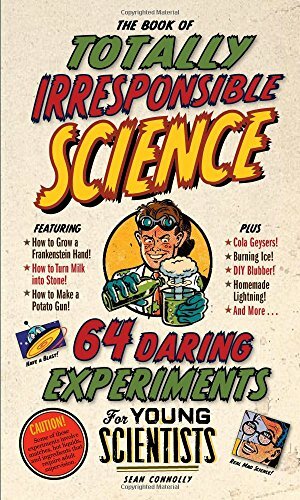 I would do this lesson that my friend Anne Marie wrote- https://www.futureflyingsaucers.com/sin-will-touch-others-genesis-4-cain-and-abel-object-lesson/ and then add the jar with the salt and corn. At the end, I would explain how Christians are to be salt and because we are salt, we are to be in the world but not of the world. SO it’s like we’re mixed in with the world, but we separate ourselves from sin because we love Jesus. I would talk about how without having God in our lives we can fall through the cracks of life just like the popcorn. Look up particle segregation….then you will have an accurate reasoning on why this happens. Cool— how long does it take for the popcorn to rise to the top? Thanks for your time and great list of books! I’m a chemist and the solution is that it’s the size of the material determines. Smaller grains (salt) can move more easily past the salt, but the larger grains (corn) cannot slip through the salt. You can try this experiment with golf balls and sugar to refute the idea that it’s related to density. Similarly, try it with rocks, pebbles and sand. I don’t know about the density of sugar vs golf balls, but a jar of different sized pebbles works the same way and they would, if all made of the same materials, be the same density. This also works the different sizes of all glass or all plastic beads. Again, they are all made of the same materials. Now this is a science experiment for which I actually HAVE all the ingredients! !